Wyllow Pet Hospital now has a state-of-the-art ultrasound imaging unit! owners a new option for non-invasive diagnostics for their pets. 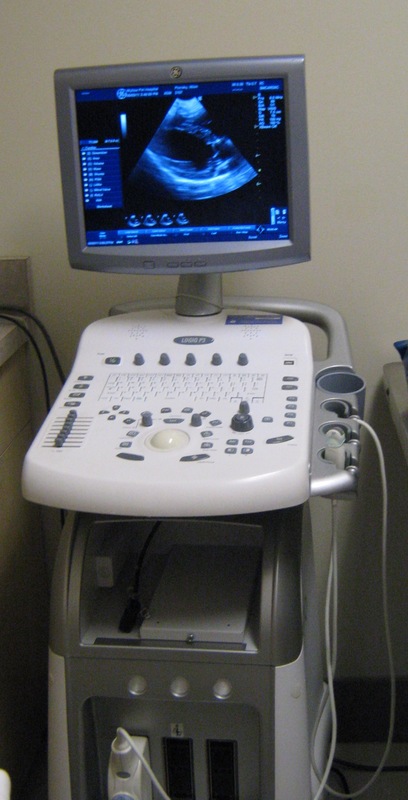 Ultrasound can be utilized to image in great detail a variety of body areas and organs. It is useful in evaluation of almost all abdominal organs (liver, kidneys, spleen etc.,) as well as the heart and reproductive tract. In addition, ultrasound can be used to help guide biopsies safely into a structure to be sampled, detect masses, intestinal irregularities or lymph node enlargement, and is the absolute best way to assess a pet’s heart structure and function – such as when murmurs are ausculted. In fact, our new unit even provides color flow Doppler, allowing us to actually “see” the blood flow through vessels and organs! We at Wyllow Pet Hospital are always searching for new ways to keep up with the latest technologies, not only for our benefit but for you and your pets'. Our newest upgrade has been in our in-house laboratory! We've upgraded to the Idexx VetLab! These machines can do and show amazing things regarding your pets internal functions. We've always been able to do in-house bloodwork, but these machines are far superior. Giving us faster, more accurate results, which in turn gives you, the clients, faster answers. We can now run more specialized tests that we used to have to send to a reference lab, making us more amenable to your needs. Pets can't say how they're feeling- it's usually how they look or act that tells you something is wrong. You play a key role in helping your pet combat illness and stay as healthy as possible. Awareness of the warning signs and regular preventative health screens, including a physical exam and blood work, are best ways to ensure your pet lives a long, healthy and happy life. How do you know if your pet should have an ultrasound? Because we can image entirely through an organ – evaluating its texture, structure, and vasculature - this imaging is often recommended when an abnormality is suspected or detected, and further information about an organ or system is needed. However, many people often elect routine imaging of apparently healthy pets for otherwise undetected health concerns. Ultrasound is a safe and versatile tool for doctors and pet owners alike! It is a very affordable alternative to other diagnostic procedures. We at WPH are so excited to bring this technology option to the pets of our area. Please don’t hesitate to contact us if you would like more information! We are excited to announce our most updated piece of technology! Digital radiography allows us to get a much clearer image. This enables our Veterinarians to get a better understanding of what might medically be going on with our patients. Going digital also provides us with an image within a fraction of the time!